Our secretary provides an insight into how the Committee deals with numerous planning applications throughout a typical month. The day following the monthly committee meeting, we begin the cycle of receiving listed building planning applications concerned with the Stamford Conservation Areas, which are forwarded to the Chairman and the Secretary by Planning Officers at South Kesteven District Council. As a back-up, diligent members of the Committee will check the local paper and every yellow planning application affixed to or adjacent to a building in the town to ensure none fall through the net. On receipt of an application, it is sent out by email to the Committee members and to the Architectural Advisors, asking for their advice and comments. Where considered expedient, a Committee member may visit the site to speak to the workmen or to the owner of a property to find out exactly what is going on. As you may imagine , Committee members may differ in their views, just as the members do, and lively debate often ensues. However, the Architectural Advisors are always listened to with respect and their words are often largely incorporated into the Chairman’s response to SKDC, following discussion of every current application at the monthly committee meeting. It may not seem an onerous duty, but it is time consuming because every application is scrutinised thoroughly, every Committee member has the chance to put forward their opinions and thoughts and may refer to the historical background to a present application. The Chairman is particularly good at noticing an address for which there may have been an application put forward two years previously. So, what was scrutinised in this particular month? Replacement windows and door to a property in Rutland Terrace; demolition of an extension and erection of a new one in St George’s Street; and replacement fascia and hanging sign in the High Street. Signage receives a great deal of attention: the Civic Society advocates sticking closely to SKDC’s Stamford Shopfront Design Guide, produced in 1993, and we frequently have to remind SKDC of it. We are not opposed to new signs per se, but they should be in keeping with the historic nature of the town centre. We considered the repainting of a shop front in Broad Street and did not object once we had checked the proposed colour was appropriate. We were unhappy about alterations to the central staircase in Stamford Walk and the professional concerns raised by the Architectural Advisors were duly passed on to SKDC for their consideration. An alteration to a structural wall at The Riverside worried the Architectural Advisors: their concerns were passed to Ian Wright, SKDC’s Principal Conservation Officer, with whom we have excellent relations, and he thanked the Society for this information and promised to check it out, which he duly did. The relocation of an internal wall in Broad Street raised no objections, nor did the new signage planned for The Millstone Inn; a boiler and window replacement in High Street St. Martin’s raised no objections similarly. However, the Society was alerted early to the re-emergence of an application from Kier Living for an amended development on the Kettering Road. Working with other concerned groups and individuals, some of whom are members, the Society formulated a response similar to the previous year’s but with additional information. 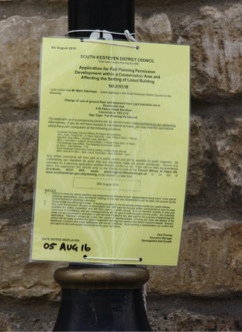 The application will be considered by The Development Control Committee in Grantham, but as we go to press the situation remains unresolved. One busy month (May 2016) for the Committee, striving to ensure that the aims of our Society are upheld.